GAZA CITY, Gaza Strip (AP) — Palestinians resumed their fiery protests at Gaza's border with Israel on Friday as a U.N. human rights body criticized Israel for the "disproportionate and indiscriminate use of force" that killed at least 59 Palestinians earlier this week. Israel condemned the resolution by the U.N. Human Rights Council as biased. 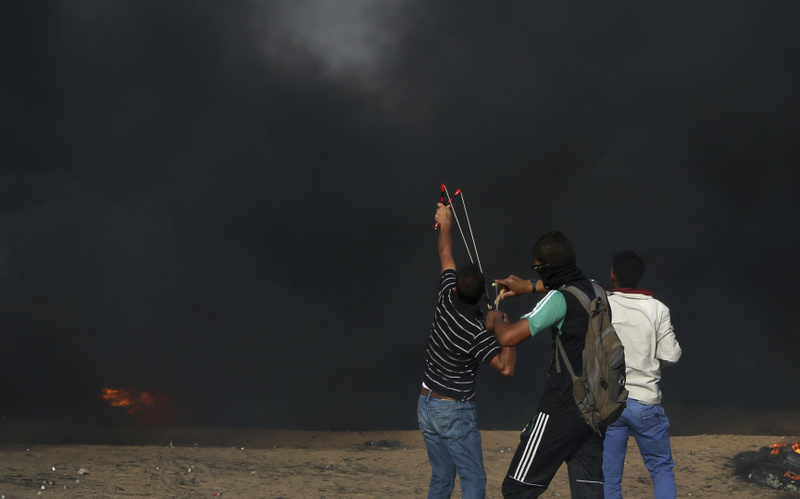 Friday's Gaza protests — the eighth in as many weeks — drew Israeli gunfire and tear gas, with at least 23 people wounded, the Gaza Health Ministry said. Friday's protests began later than in recent weeks and drew a smaller turnout, apparently due to the Ramadan fast. Most of participants gathered in tent camps a safe distance from the border, but dozens still got close to the fence. Meeting in a special session, the council voted 29-2 with 14 abstentions to back a resolution that also condemned "the disproportionate and indiscriminate use of force by the Israeli occupying forces against Palestinian civilians." The "independent, international commission of inquiry" mandated by the council will be asked to produce a final report in March 2019. U.N. High Commissioner for Human Rights Zeid Ra'ad al-Hussein backed calls for an international inquiry and questioned Israel's assertion that its security forces tried to minimize casualties. "There is little evidence of any attempt to minimize casualties on Monday," he said. Some demonstrators threw firebombs, used slingshots, flew burning kites into Israel to set fields ablaze and tried to use wire-cutters on the border fences, but "these actions alone do not appear to constitute the imminent threat to life or deadly injury which could justify the use of lethal force," said Zeid, a Jordanian prince. Israeli Prime Minister Benjamin Netanyahu denounced the resolution, which was put forward by countries including Pakistan, as "nothing new under the sun." "An organization that calls itself the Human Rights Council once again proves that it is hypocritical and biased and that its purpose is to harm Israel and support terror. But mostly it has proven that it is irrelevant," Netanyahu said. Israeli ambassador Aviva Raz Schechter said "the unfortunate outcome of Monday's riots can only be attributed to Hamas' cynical exploitation of its own population in a violent campaign against Israel." U.S. Ambassador to the United Nations Nikki Haley said in a statement that "the U.N.'s so-called Human Rights Council has decided to launch an investigation into a democratic country's legitimate defense of its own border against terrorist attacks. It is another shameful day for human rights." In an apparent attempt to ease the crisis, Egyptian President Abdel-Fatah el-Sissi announced the opening of the Rafah crossing on Thursday night for what would be the longest uninterrupted period since 2013. He wrote on his official Twitter account that it would "alleviate the burdens of the brothers in the Gaza Strip." Egypt and Israel have imposed a blockade on the Gaza Strip since 2007, heavily restricting movement in and out of the densely populated and impoverished territory. Over the years, Egypt has opened the crossing for a few days every two to three months, the only way for most Gazans to reach the outside world. Hamas leader Ismail Haniyeh said the opening was the result of talks Sunday in Cairo with Egyptian officials. "We are witnessing the outcome through steps Egypt has taken, and we hope they continue, develop and increase," he said at a Friday prayer sermon in Gaza City. But he added that the weekly Hamas-led protests will continue. The crossing has been open since May 12, so el-Sissi's announcement was technically an extension. Egyptian authorities said 510 people crossed Wednesday, with most going from Gaza to Egypt. On Thursday, 541 people passed into Gaza along with dozens of trucks carrying cement, steel, power engines and medical and food aid from the Red Crescent, the officials said. Last month, Hamas' Interior Ministry said more than 20,000 people were on waiting lists to exit. An average of 500 travelers a day moved through the border this week, mostly leaving. The Rafah crossing has only been open sporadically since the 2013 ouster of Egypt's Islamist President Mohammed Morsi, a high-ranking member of Hamas' parent group, The Muslim Brotherhood. While Egypt has been struggling with an Islamic insurgency for decades, militant attacks increased after Morsi's ouster, leading Egyptian authorities to tighten movement to and from Gaza. Travel through Rafah has mostly been restricted to humanitarian cases, with priority given to medical patients, students admitted to outside universities and Palestinians with residency permits in third countries about to expire. Palestinian-Egyptians and dual nationals are also eligible to apply. Travelers moved slowly toward the border Friday. A bus arrived about every hour with people whose names appeared on lists provided by Hamas officials. Hamas forcibly wrested control of Gaza in 2007 after winning legislative elections, triggering the Israeli-Egyptian blockade that has severely restricted the movement of most of Gaza's 2 million inhabitants. After more than a decade of Hamas rule, conditions for most inhabitants are dire. Unemployment is over 40 percent, tap water is undrinkable and Gazans receive only a few hours of electricity a day. Hospitals face constant shortages from the blockade, and parts of the territory are still waiting to be rebuilt after a 2014 war with Israel. The measures were meant to create a buffer zone as part of Egypt's efforts to purge northeastern Sinai of Islamic militants following the 2014 bombings by an Islamic State group affiliate that killed dozens of soldiers. Egypt imposed a state of emergency and curfew in northeastern Sinai, including Rafah, which means travelers arriving at the crossing after 7 p.m. must wait until the next morning to leave.